A nun from the Carmel of the Mother of God and Unity in Harissa, Lebanon, “wrote” this icone at the request of Archbishop Cattenoz. Mary, tiny on the altar icone, and the Holy Spirit, whose rays shine forth from the corner circles, are his WHOLE LIFE. Mary keeps watch in the darkness, for She is the star shining in the darkest of nights… She is nothing but Mother, entirely Mother. “Our Lady of Life”, this “something” that Father Marie-Eugene discovered little by little. He is present, our Friend, our Guest, He is present, the One who builds the Church . . . for as Our Lord says, from those who have the Spirit and believe in Him will flow rivers of Life. The Holy Spirit works through these souls. These “rivers of Life” are represented as gushing forth from the black chasm, black from the darkness of Faith lived out in prayer and suffering. Father Marie-Eugene’s hands are raised toward God, highlighting the attitude of trusting prayer that characterizes him, for he knows he receives everything from God’s grace when he lets himself be led by his grace, as his motto expresses: “Traditus gratiae Dei” (surrendered to God’s grace). Totally oriented toward God, we nevertheless see him turning toward Little Therese: his prayer life makes his thirst for God increase. He looks to the one who shows him the shortest way: love you littleness, your poverty and hope blindly in the Mercy of Jesus. That’s what Saint Therese is showing us on her parchment. Looking at the icone we can hardly see, in the bush, little birds representing this poor prayer taught by Father Marie-Eugene, but lived by him even more. They also represent that legion of little souls that Saint Therese had asked Our Lord to choose, and to which Father Marie-Eugene belongs. 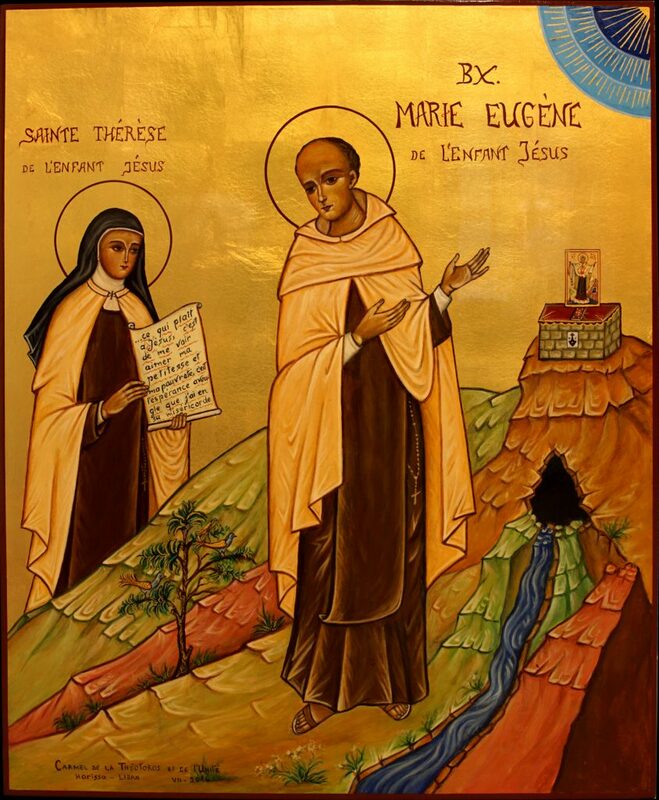 The mountains between Saint Therese and Blessed Father Marie-Eugene signify separation and elevation: from Heaven above, Little Therese directly influenced his life and mission, raising his soul and that of many others with him, toward Heaven. In his thirst, in turn, to give souls to Jesus, with a prophetic spirit (symbolized by the white cape of the Prophet Elijah’s sons), Father Marie-Eugene saw other souls’ own thirst for the life of silent prayer. “Notre-Dame de Vie” was founded so that apostolic action and contemplation would always be closely united in the Christian life. “Of the Child Jesus,” Saint Therese and Blessed Father Marie-Eugene’s shared name, is visible on the gold background. Both of them seem to lead along this path of spiritual childhood, those who, by contemplating this icone, let themselves encounter their gaze.